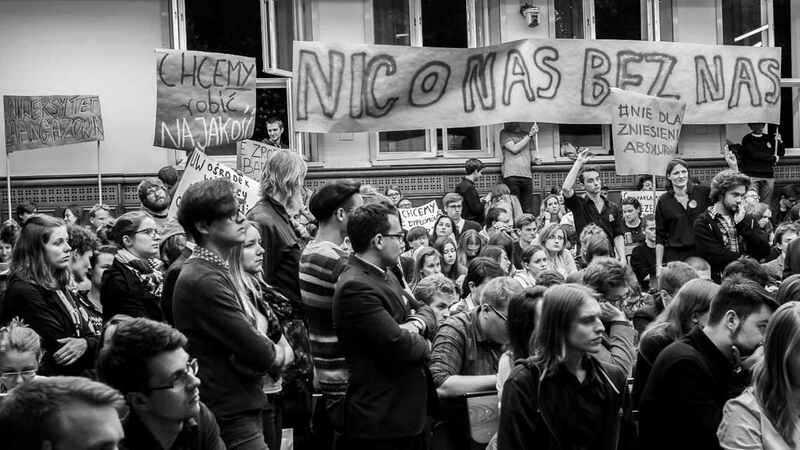 Students protest at University of Warsaw: Nothing about us without us! It all started with an attempt to force some damaging changes onto the Regulations of Studies on University of Warsaw without even consulting the students. It all started with an attempt to force some damaging changes onto the Regulations of Studies on University of Warsaw without even consulting the students. First of all, it concerns the introduction of fees for submitting theses at a term beyond the last year of studying. It is being called a mean to fight the “eternal students” phenomenon but in fact it’s fighting the students who want to complete their works solidly and hence require more time to achieve that. Changes to the regulations provide the authorities of University of Warsaw with a financial whip that wouldn’t serve the quality but market effectiveness. Secondly, it is about how these changes are being made and it’s behind the backs of the main stakeholders. As there was no official communication the members of the Public Sociology Scientific Circle learnt about that only due to rumors. Discussions with other students led to a protest that started on April 20th during the session of Students’ Parliament. It was a date when parliamentarians were about to vote on the project of the new regulations but eventually it was postponed to May 11th due to technical reasons. Thus another protest was planned for this particular day. Almost 3000 students signed the petition against the introduction of changes and around 160 scientific employees supported the open letter. Between those two parliamentary sessions a new initiative was launched – The Engaged University [Uniwersytet Zaangażowany]. Its’ members started a broad information campaign amongst the students and lecturers as some of them were not even aware of what was happening. As a result almost 3000 students signed the petition against the introduction of changes and around 160 scientific employees supported the open letter. Support was also provided by public persons and lecturers from other universities. Within the information campaign the leaflets presenting the most crucial facts were prepared along with invitations to the protest on May 11th. Last Saturday – when yearly student carnival was taking place at the university – two supporters were thrown out of campus for handing out these leaflets. Supposedly a permission to distribute leaflets was required from the university chancellor – Jerzy Pieszczurykow – even though his secretary claims it is not his authority to provide any. Furthermore, she’s not aware whether there’s even a regulation concerning this activity. Ironically, security guards apprehended the students few steps away from a tablet commemorating the events of March 1968. As the campaign continued the university president – prof. Marcin Palys – began to notice the popularity of students’ movement. A week after the protest started a mail was delivered to students in which the president claimed to “fix” information spread by The Engaged University. In fact it was once again a repetition of the arguments already debunked by the protesting students. The fact concerning the changes to certificate of completion and fees within the university regulations being an attempt to legalize an illegal practice was completely ignored. Some time later a mail was received by university employees, those who had articulated their support for the protesters like prof. Wagner who was defending the students on the radio. It was not a mere manipulation anymore, it was a call for obedience and an attempt to contest the authority of lecturers. In his mail the president claimed that they have no idea what they’re talking about and sign every paper handed by students recklessly. It is not only that lack of information on changes, their essence and introduction mode are problematic – the members of The Engaged University emphasize that it’s the current condition of academy which is at stake. As it is getting closer to the market the ethos is being left behind, democratic values are being forgotten and quantity is being put above the quality. That is the reason why this initiative claimed the words from the university president’s opening speech and turned them into a contradiction: “university is not a private business and accounting is not the queen of the sciences”. Finally May 11th arrived. Around 200 people gathered on the session of Students’ Parliament holding the banners and sporting yellow squares attached to their shirts as a symbol of the initiative. They all barely fit inside the chamber. “I am not a customer, I am a student”. Student protest at the University of Warsaw. Photo by Michał Wende. Few hours later came the news that the university president would be present to the session. Prof. Palys explained this decision with his will to debate which could not be done earlier. A buzz raised amongst the students as it was an exceptional situation: after all the Students’ Parliament remains an independent institution. The president spent two hours giving a speech and he wasn’t dialogue-oriented at all. The questions raised by students were twisted and never really answered, part of them just ignored. The most striking example would be his answer to a question whether university had broken the law by collecting fees for renewing studies at the day of thesis defense. Instead of admitting to a false statement, the president insisted that problem was only related to an invalid renewal procedure. 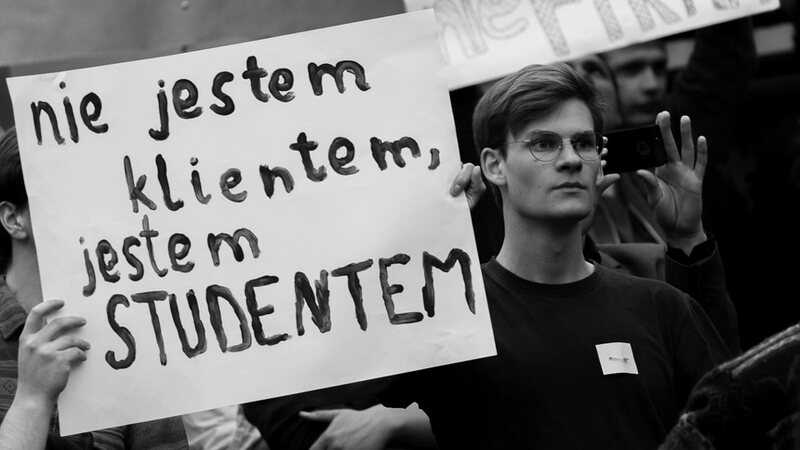 Student protest at the University of Warsaw. Photo by Michał Wende. Perhaps the most painful was what happened on the session when the president left. The students that had arrived at the session were willing to discuss the regulations, however in the meantime there was a proposal launched to reject all discussions. When loud discontent raised, next proposal come up to keep the voting on the discussion secret. This proposal was accepted by the majority of voters and the voting for discussion – that took place anonymously right after – was lost. Perhaps the most painful was what happened on the session when the president left. The students that had arrived at the session were willing to discuss the regulations, however in the meantime there was a proposal launched to reject all discussions. After the voting one of the parliamentarians proposed a referendum concerning the regulations. It was the very last chance for the ones fighting against the harmful changes but at the same time an obvious resolution to this controversial topic. What was the answer that came? “A referendum is pointless as the parliament remains the people’s representative and people will not read the regulations anyway hence decision needs to be made without people participating”. Thus the referendum was not even put to a vote as this early proposal was rejected. It was the moment when students’ patience ran out – they were disgusted and disillusioned with Parliament’s politicking and opportunism, disappointed with their voice being ignored and a calculated obedience of parliamentarians towards the higher authorities of the university. Shouting “Nothing about us without us!” – emphasizing that no agreements regarding them can be made without their active participation – students left the chamber. At the end Students’ Parliament approved the proposed shape of Studying Regulations. 29 people voted for, 26 against, 3 abstained. This sorry end of Parliament’s session does not mean the end of the struggle. It’s only the beginning. Perhaps without all these disturbance and rumors, the regulations would be changed silently and students would simply face the facts and humbly accept them. It’s well known that since the primary school they are taught to obey the decisions and caprices of their superiors on one hand, and are told that their fate is in their own hands and they should focus on it only on the other. It is common to complain about the weakness of civil society, the absentism of social capital and the lack of trust. In a well performing democratic society such values and attitudes should be shaped by academies. During the last few years this solid foundation of social life has crumbled. The Engaged University is a chance to put it back together, the biggest one since the eighties. 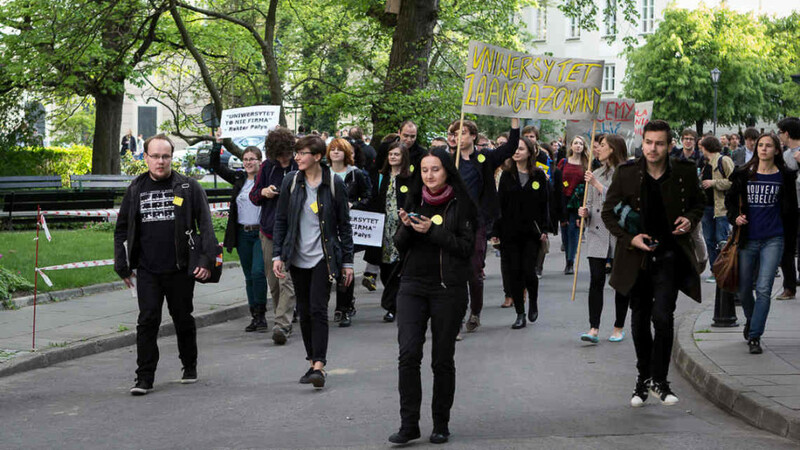 On the upcoming Friday, May 15th, at 12.30 pm a rally will take place at the main gate of University of Warsaw to stand for the democratization of university and against the commercialization and students’ voices being ignored. As university is not a private business and accounting is not “the queen of the sciences”. Translated by Grzegorz Ozimek. Photos by Michał Wende.